The DENAS Vertebra 2 is used in the treatment of acute and chronic pain in the back, the correction of functional disorders in internal diseases, rehabilitation after diseases and surgeries to enhance adaptive capacities of the organism during intense physical and psycho-emotional apparatus nagruzkah.V implemented a fundamentally new way of electro stimulation with a “traveling wave” Utilizing all 48 electrodes in a continuous wave pulsing the preset frequencies along the entire length of the spine from the cerebral zone to the lower lumbar zone. The DENAS Vertebra 2 is a great addition for Reflexologist, Acupuncturist and Chiropractors. Utilizing advanced SCENAR technology created in Russia over 40 years ago that has proven results. 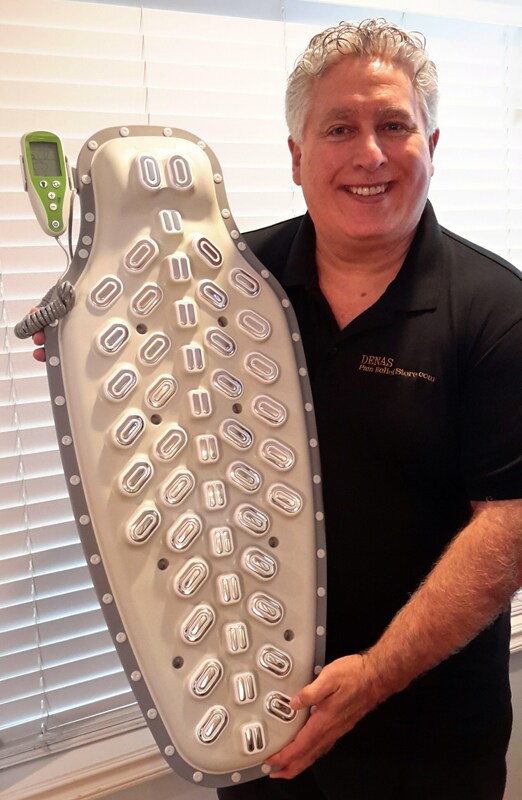 Through Denastherapy utilizing the 48 electrode heads the DENAS Vertebra 2 communicates through the nerve endings to initiate the bodies natural internal pharmacy of Endorphins and Neuropeptides making it Drug free and non invasive. :Program A- Is a continuous preset wave used for treatment of stress, neurosis, the correction of sleep disorders; comprehensive treatment of cardiovascular diseases, bronchio pulmonary and digestive systems; increasing the overall resistance of the organism. Program B- Is for DENAS therapy of acute pain and through zone selection you can treat the cervical, thoracic or lumbar region. Also treats pain surfacing from internal diseases, rehabilitation in the postoperative period. Program C- Is for Chronic pain that has been around for weeks or months and exacerbation of chronic diseases of internal organs. Program D- Is used to treat specific localized pain when the subject knows the exact location of pain. By pressing the left button you can chose 5 different locations of treatment down the entire length of the spine. New! Program E -Individual prevention and treatment of acute and chronic diseases can improve the results of treatment of acute and chronic back pain in the exchange application programs B and C.
* Application of the device DENAS-Vertebra in the treatment of spine: Method. Recommendations. – SPb. : SPbMU them.Acad. IPPavlova, 2011. – 20 s.ApplicationWhen using the device, please note that the most pronounced therapeutic effect occurs as a result of a course of treatment. Its duration is for some diseases 6-8 procedures 8-12 for the other, at least 14-20 procedures. – As a symptomatic treatment for various diseases and syndromes. There are contraindications For proper procedures DENS devices, as well as to determine the optimal combination with other treatment is required to read the instructions for use and consult with a specialist. For more information or to purchase a DENAS Vertebra 2 contact Denas PainRelief Store Located in Portland Oregon, your USA Headquarters for Health and Wellness Products, Support and Training. We are open 24 hours a day, 7 days a week. Call 503-395-4142 and Coach Jimmy K or one of our friendly staff members can answer your questions. Denas Pain Relief Store has Same Day Lightning Fast Shipping. USA orders arrive coast to coast in 2 days and we ship Worldwide using Special Express Airmail from PDX International arriving to your country in generally 3-5 days. We look forward to serving you.